M odern medicines may not all be miracles but they certainly work wonders. Prescription medicines provide the best value in health care. They not only save lives, they save money. They reduce the costs of other more expensive forms of health care and keep patients out of the hospital, out of nursing homes, out of emergency rooms, out of surgery and in the home and on the job. Modern medicines developed in large part by the U.S. pharmaceutical-research industry enable patients all over the world to lead longer, healthier and more productive lives. Industry critics fail to acknowledge the true value provided by prescription medicines. They also fail to acknowledge the risks and costs of pharmaceutical innovation. And they inaccurately claim that the federal government substantially subsidizes the development of new medicines and that drug prices are too high. These distortions and inaccuracies will be rebutted by the facts. Critics also complain about the difference in the cost of medicines in the United States and abroad. The difference stems from the fact that foreign governments impose price controls on prescription medicines, but the citizens of those countries pay a high price for these controls. The controls undermine the competitiveness of the pharmaceutical industries in these countries and drive them to transfer research and development operations to the United States, where the relatively free pharmaceutical market encourages the development of new medicines. And the price controls in foreign countries substantially limit and delay the access of patients to the newest and most effective cures and treatments that in many cases long have been available to American patients. Life expectancy is increasing, infant mortality is decreasing, disability rates among the elderly are falling and progress continues against many diseases. "These improvements in key components of our public's health all point to one source: major pharmaceutical breakthroughs in the 1990s," health-care analyst J.D. Kleinke wrote in the September/October 2001 issue of Health Affairs. In a June 9 speech to the Commonwealth Club in San Francisco, Food and Drug Administration (FDA) Commissioner Mark McClellan stated: "As a result of changes in health care, millions of heart-attack patients who several decades ago would have died quickly or would be given largely comfort care for heart failure can now expect to live a long and high-quality life. Diabetics who used to see a relentless progression to heart disease, kidney failure or worse can now often throw away their needles. Even cancer patients who often faced long odds and miserable chemotherapy are experiencing longer lives, and fewer and shorter serious side effects of treatment. "Some economists who have looked closely actually estimate that the value to society of the longer and better lives that have resulted from translating new biomedical knowledge into steps to prevent and slow diseases is worth literally many trillions of dollars in better health in particular, the value of biomedical innovation to our nation equals the value of innovation in all other sectors of the American economy combined." 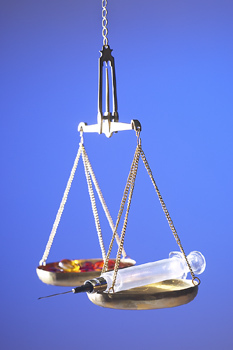 Numerous studies prove the cost-effectiveness of modern medicines. In a March 2002 study, for example, spending increased fourfold for Alzheimer's patients who were receiving drug therapy, but total health spending for these patients declined by one-third. Average prescription-drug costs for the patients receiving treatment was $1,046 higher than for the control group that did not receive such treatment. However, the patients who received drug therapy had inpatient hospital costs that were $2,883 lower than the costs for patients in the control group. With a pipeline of more than 1,000 new medicines in development, pharmaceutical companies using cutting-edge science are developing even better, more effective therapies that increasingly will be tailored to the needs of individual patients. New medicines in development (i.e., either at FDA awaiting approval or in human clinical trials) include more than 80 in the pipeline for HIV/AIDS, more than 120 for heart disease and stroke, almost 400 for cancer and more than 800 for older Americans. The development of a new drug is a long, risky and expensive process. The pharmaceutical industry invested an estimated $32 billion in 2002 in discovering and developing new medicines. Economists at the Tufts Center for the Study of Drug Development estimate that it takes 10 to 15 years to discover and develop a new drug from the laboratory to approval by the FDA. Only one of 5,000 screened compounds is approved as a new medicine. Of these 5,000 compounds, 250 enter preclinical testing, five proceed to clinical testing and one is approved by the FDA. Only three of 10 marketed drugs generate enough revenue to match or exceed research and development (R&D) costs. The average cost of developing a new drug, according to the Tufts economists, was $802 million in 2000 dollars, up from $318 million in 1987. The cost includes the expenses of project failures and the impact that long development times have on investment costs. The increase in the cost of drug development has occurred in part because pharmaceutical companies are targeting more complex chronic diseases. These diseases require more clinical trials, more patients in the trials and more procedures for each patient, with the time required for clinical testing more than tripling to an average of nine years by the late 1980s. A large part of the cost of developing new drugs, critics charge, is picked up by the federal government. The General Accounting Office, in a July report, became the latest federal agency to refute that claim. It found that in 2001 the government had licensing rights to only six of the top 100 brand-name drugs the Department of Veterans Affairs purchased in 2001 and to only four of the top 100 brand-name drugs the Department of Defense dispensed. The study confirmed a report by the National Institutes of Health (NIH) to Congress in 2001 in which the NIH found that only four of 47 drugs with U.S. sales of $500 million a year had been developed in part with technologies created with NIH funding. Unable to quantify a direct relationship between government-funded research and commercial products, the congressional Joint Economic Committee instead calculated that increased life expectancy in the United States resulting from private-sector advances in health care creates annual net gains of about $2.4 trillion (in 1992 dollars). The committee concluded that "if only 10 percent of these increases in value ($240 billion) are the result of NIH-funded medical research, it indicates a payoff of about 15 times the taxpayers' annual NIH investment of $16 billion." Critics also exaggerate spending on drugs by the consumer. Prescription medicines even though they are the most cost-effective form of medical care represent just 10 cents of the health-care dollar. This dime pays for all of today's medicines and the research on new medicines. The growth in spending on drugs fell by 5.1 percentage points last year to about 12 percent, according to data from IMS Health, a health-care information firm. Spending growth is projected by the Centers for Medicare and Medicaid Services to continue declining during the next 10 years. Price inflation on existing medicines fell to 3.8 percent in 2002, the lowest level in four years. Most of the growth in spending on medicines is the result of the increased use of existing medicines and the use of newer medicines, not the result of price increases. Spending on outpatient prescription drugs (including brand and generic ingredients and the cost of pharmacies and others in the pharmaceutical-distribution chain) accounted for one-tenth of overall health-care spending in 2001. A new PhRMA study further shows that prescription-drug costs represented 9.5 percent of the average health-maintenance (HMO) premium increase between 2001 and 2002 and less than one-fifth of the total increase in HMO premium costs during 1997-2002. An analysis of the treatment of diabetes highlights some of the factors driving drug spending. In the last decade, the number of people diagnosed with diabetes increased by 50 percent and continues to rise. Four new classes of medicine were developed to treat type-2 diabetes and are being adopted by physicians as key tools in the fight against the disease. Current standards of care increasingly emphasize drug therapy in treating diabetes in addition to diet and exercise. And disease-management strategies are emphasizing the use of medicines to treat diabetes because drugs can yield better health outcomes at lower overall costs.